The tip of a seed head from a purple cone flower. Finding this particular object is rich with potential. 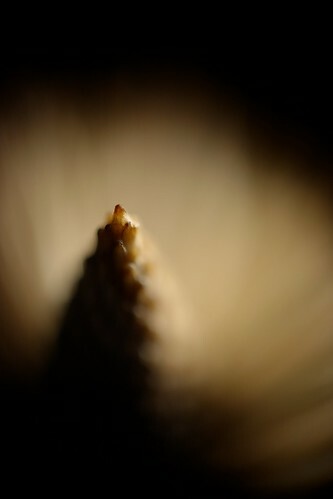 In the reverse lens macro world the extreme shallow DoF creates a very selective focal point/plane which across different subjects creates a more or less visible “section plane” – like a cross section of sorts. This is only the tip of the seed head, the seeds had fallen off this particular stem – which revealed the positioning and where all the seeds emanate. This entry was posted in Matt Niebuhr - Photography by Matt Niebuhr - West Branch Studio. Bookmark the permalink.